8/31/17 - Enjoy your Labor Day weekend! In celebration of the upcoming Labor Day holiday, the shop will be CLOSED on Saturday, September 2nd, and will re-open on Tuesday, September 5th. This ruler has the Bloc_Loc patented technology channel machined for accuracy underneath 1/8" clear acrylic. This channel locks the seam allowance in place and allows the quilter to square up a half-square triangle block in just seconds with ultimate accuracy and safety. 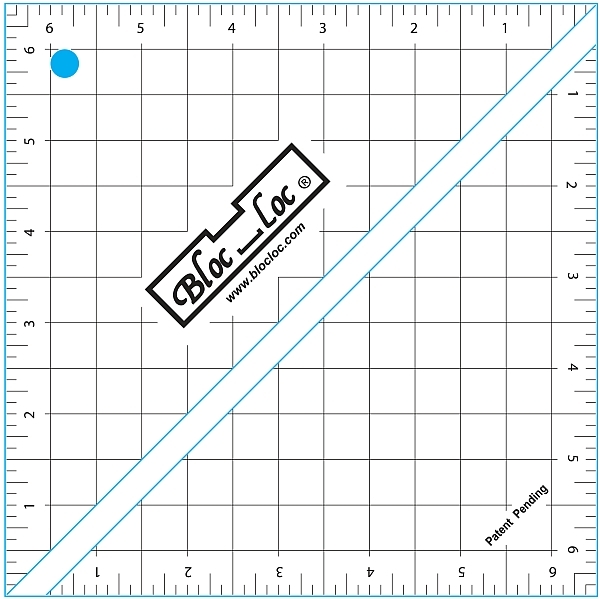 No turntable is necessary, just turn the ruler and your fabric moves with Bloc_Loc. No more "ruler rock" or slipping! The ruler has easy-to-read solid markings throughout every 1/2" and perimeter markings to 1/8". Click to see a demonstration video of the Bloc-Loc in action! This fabric collection for this year's event is Natural Beauty by Kanvas Studio. This beautiful wildflower print in a black, cream, gold, rust and green color way will make this one of the best in the history of the shop hop! NOTE: We are repeating these classes due to popular demand! This time, the 2 classes will be held on consecutive Saturdays. 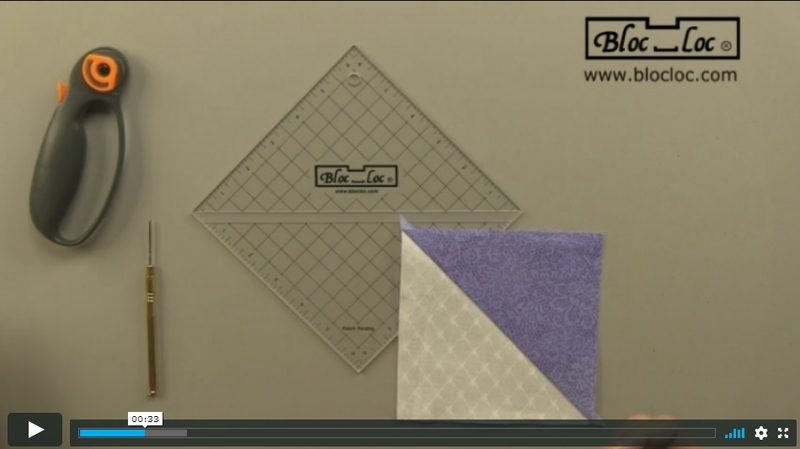 Learn how to do many basic machine free-motion quilting patterns shown below in 2 fun sessions! Class #1 is called "The Road to Stippling." 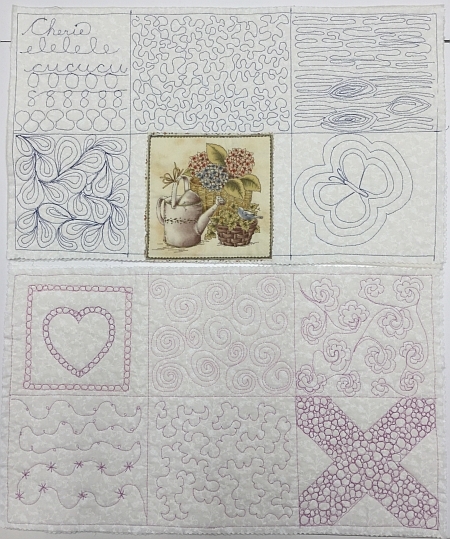 You will learn how to sew cursive, paisley, ripples, wood grain, echo, enhance a print and stipple quilting. Class #2 is called "The Road to Pebble Stitching." You will learn how to sew string of pearls, lights, stars, spirals, 3's and E's, floral and pebble quilting. Both classes will be held at the Palmerton Library, located across the street from the shop, in the upper floor Gallery. Elevator access is available to the upper floor. Class Fee: $15 each OR $25 if you take both classes. Students must supply their own muslin quilt sandwich squares. Supply lists will be available upon class registration. To register, you can click on Class 1 or Class 2 above to sign up online. You may also sign up over the phone by calling the shop at (610)900-4700. Please note that if you register for both classes online, you will be charged $15 for each and will receive an immediate $5 refund after we process your order. Hello fellow Quilted Crow Inspectors (QCI)! This easy 76” x 92” mystery quilt is a perfect way to start your Fall quilting projects! You only need 4 coordinating fabrics, one light and one medium neutral such as a white, cream or gray, and one medium and one dark of your favorite color fabric. To register, either click the image above or click HERE to visit the sign-up page on our website. You may also sign up over the phone by calling the shop at (610)900-4700. The pre-clue will be ready for distribution on Friday September 8th for $10. If you finish your pre-clue by Sept. 15th , Clue 1 is free! You have 1 week to finish each clue. If you finish on time the next clue is free, otherwise the clue is $5. Please note that Clues will be distributed only on Fridays during the Mystery Quilt event. There are a total of 8 clues and the last clue will be distributed on Friday, November 3rd so don your sleuth cap and let the detective work begin! Learn to create a purse base and reversible covers to match different outfits or occasions. Interchange them without having to empty your purse! First you will make the basic purse (~10” x 12”) with a zipper closure, 2 pockets, a boxed bottom, and straps with 4 swivel clasps. Next you will make the reversible and interchangeable button-on cover. The covers can be made with a variety of fabrics for any occasion. You can be creative and embellish the cover with beads or embroidery. The pattern also includes instructions for a checkbook clutch. The class supply list will be provided at time of registration. Eight 2-hour sessions held on alternate Fridays OR Saturdays from 10:30am - 12:30pm, starting on Friday, September 15th or Saturday, September 16th. You have the option of making either a baby quilt or a lap size quilt using 4 colors of your choice. Although you do not need to purchase your fabric from The Quilted Crow, we do require that all fabrics be quilt gradefabric. A supply list will be provided at time of registration. Class size is limited, so sign up early! To register, click on either Friday or Saturday above, call the shop at (610)900-4700 or click HERE to visit our Classes page where you can sign up for either session online. 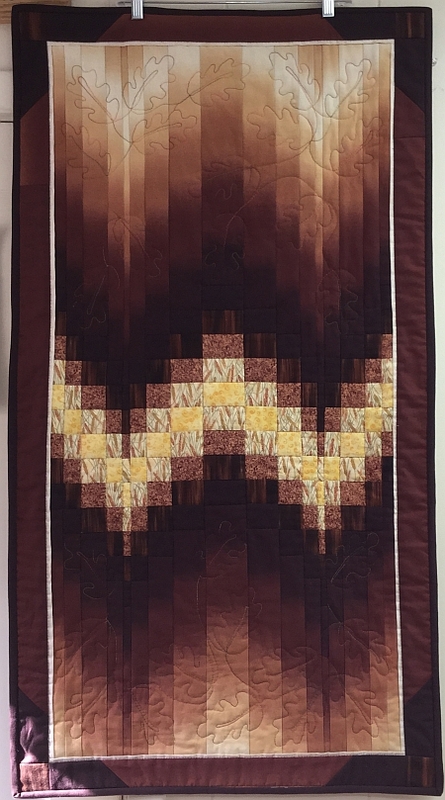 Make this beautiful 24 1/2" x 45 1/2" wall hanging in three color ways, chocolate, teal, or purple! This quilt is much easier to create than it appears! If you can sew nine 2-inch strips of fabric together, you can make this wall hanging! It is a beautiful project in either of the color ways. The shop has Chocolate, Teal and Purple ombre' as well as coordinating fabrics for sale. Take 10% off your class fabrics when you sign up for the class! Due to the amount of work space needed for each student this class will be held at the Palmerton Library, located across the street from the shop, in the upper floor Gallery. Elevator access is available to the upper floor. Crow Sew - The next scheduled meeting at the Crow will be onWednesday, September 13th at 10am. Block of the Month - The next instruction session at the Crow will be onTuesday, September 19th, from 10:30am - 11:30am. Quilts of Valor - QoV is on hiatus for the summer, the next scheduled meeting/sewing session at the Crow will be on Saturday, September 23rd. Sewcial Guild - The next scheduled meeting will be on Thursday, September 28th, from 11am - 2pm. The guild meets in the upper floor Gallery of the Palmerton Library, across the street from the Shop. Elevator access to the upper floor is available.